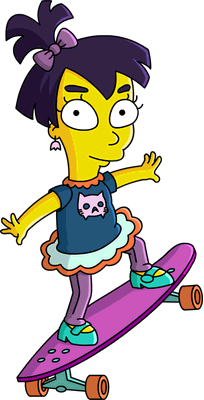 Nikki McKenna is a girl from Springfield Elementary School. Bart is forced to sit with Nikki after the teacher disappears, and he smoothly flirts with her. Nikki at first seems to be annoyed by Bart, until Bart asked to draw on her shoulder. However, Nikki switches her point of view (a.k.a. 'Hot then Cold') at anytime. Bart asks Grampa for advice, and Grandpa's recommendation is to kiss Nikki. After, Nikki and Bart go free styling on a Skateboard, until Bart steals a 1st Base Kiss on top of the slide. Nikki freaks out, and shouts in disgust. Nikki's parents have a meeting with Homer and Marge, and Principal Skinner decides to make a Hands Off Policy in Springfield Elementary. After a disastrous assembly, Nikki smooches Bart. The couple view First Lady Of USA "Michelle Obama" on the schools roof. Bart reveals his feelings to Nikki, and she once again freaks out. Accidentally, Bart trips off the roof. Nikki was worried until Bart started to breathe. She performed emergency mouth to mouth CPR to save Bart. In the last moments of their relationship, Nikki says she will never tell why she was Hot then Cold. Bart later went to see Nikki, who was at first angry to see him, asked for a kiss, told him it was inappropriate, was nice again then called him a stalker and shouts "save me!". Bart walked away from her house after this. Nikki seems to love skateboarding, and rides a purple 70s style skateboard. Like Bart, she seems to be a rebel, but with a better reputation. This section is transcluded from The Simpsons: Tapped Out characters/Even More Kids. To edit it, please edit the transcluded page. Modified on February 20, 2019, at 10:38.